NOTE: I wanted to share this post again with a few edits and updates, most notably, the Leave No Trace Center’s Social Media Guidelines which I was unfamiliar with when I originally published this post. I’m bad at social media. I very much love to use it, to share and consume content, but I’m not consistent. I’m sure that part of that is a byproduct of the really weird hectic schedule that I keep. I also have a weird attention span that alternates between obsessive tunnel vision and scattered focus. Still, overall I think social media can be a good thing, and I’ll admit that Instagram is one of my favorites. It isn’t without its flaws though. Instagram makes it easy for the dreaded fear of missing out to pop up. Yet I keep coming back to Instagram every day, and for good reason. I think the pros outweigh the cons, and when you use Instagram the right way, it can help you kick your own adventure life to new levels. While you definitely risk activating your fear of missing out by checking out your Instagram feed, the opposite is also true; you can find inspiration for your own adventures in those little pictures. Follow people who inspire you, not just make you envious. Don’t just skim the photos, read those captions even when they’re long as hell, and get the full story. If you’re following people whose message resonates with you, their photos and stories won’t make you feel bad about what you’re doing, they will inspire you. Are you making plans to visit a certain place? I recommend looking up that location on Instagram to find photos that will give you ideas of what to do. Search the location and associated hash tags and see what people have been up to there. You’re going to find some interesting shots that will give you some ideas of what you might like to do. A lot of people just look at the pictures, maybe “like” them, and then scroll on. That’s cool, but adventure is a community, and you can engage with that community pretty easily. I have had some great conversations with other adventurers and travelers based solely on Instagram comments and messages. Instagrammers have opened their homes to me and my wife, and we in turn have offered a place to stay for others. It’s the 21st Century; friendships aren’t location dependent, and it’s awesome to “meet” new people who are having experiences that interest you. So comment on photos beyond just saying, “Cool Pic!” Engage. Ask questions. Be sincere. Who knows, you may be talking to a new friend. Just like there are people out there that you find inspiring, you can inspire others as well. If you’re having an adventure, share it with others. Use relevant hash tags so people can find your posts. When people ask you about your hike in Yosemite, be helpful, honest, and up front about the experience. That doesn’t mean that you have to plan someone’s trip for them, or give them exact locations (keep reading, I’ll touch more on this), but it does mean you should give useful advice or assistance. Basically, just imagine how you would want someone to treat you, and treat other people that way. Pretty simple stuff! When you use Instagram for adventure, you can get some pretty awesome results. That said, having access to hundreds of millions of people comes with some responsibility. So here are couple of warnings that will help you shoulder that responsibility. The first responsibility is to yourself. You have to ensure that you are present for the experience, not just capturing it to share for likes. Clearly, I see the value in sharing experiences. That’s literally what I do. I’m a writer, content creator, and storyteller. But the experience should not be in service to the story, and I have warned of overvaluing the wrong one since Rule #4. As a content creator, it’s all about balance. I completely understand how difficult it can be to strike the right balance; like I said, this is what I do, but if you’re not really present in the moment, the photos, the article, the social media, and the whole story won’t really matter. So make sure that when you’re sharing and engaging, you don’t forget to enjoy yourself and soak up everything that’s happening without a lens in front of your face as well. Really be there. The second responsibility is to the places in which we adventure, and the people who love them. The world may be our playground, but we also need to be good stewards of the land. We can’t all trample the same spots of earth and expect the spot to remain unchanged. It is our responsibility to protect these places. That doesn’t mean people should never visit, it means we can’t all visit at once (or in a short period of time). Recently I learned that a lot of the secret spots in the Black Hills, one of my favorite places in the world, aren’t so secret anymore. Because people are sharing online and via social media, these spots are seeing more and more traffic, and this is causing problems in areas of conservation, safety, and management. Most of us want to see something unique and special, to step off the beaten path. I get it, I really do. But the truth is that some places aren’t meant to be easily found. There are spots in our world that are supposed to be hard to reach. If a person gets to those spots just by reading an Instagram post, they won’t have the same experience as they would had they from talking to a local, unfolding a map, and taking a few wrong turns. That’s why, sometimes, the most helpful thing your can tell someone is nothing. I’m eager to help all of you have more adventurous lives, but I’m not going to show you every secret spot I come upon. Part of what makes those spots special is how they’re found. "Why don't you geotag?" It's a question I get a lot (along with, of course, "where is this") Even though I could talk for hours about how excruciatingly aware I am of the impact social media has on wild spaces, and the litany of reasons why I don't participate in that aspect of it… I will abbreviate it to this: Do some research. Go buy a guidebook. Learn how to read topo maps. Chat with that crusty old local at the gas station. Set the mileage on your odometer. Go turn down a couple dozen wrong dirt roads in the dark of night. Argue with your significant other over a map or some directions texted to you from an old friend. Trudge a couple 12 or 13 mile approaches in the dead of a desert day. Take an exit because it looks like it goes somewhere interesting. Turn down damn near every dirt road you see until you find that perfect hammock spot or that secluded river bank or that breathtaking overlook. There are still wild places. There are still places that aren't advertised on TV commercials or on gigantic "Thank You For Visiting" billboards. There are still places without hoards of people and paved roads and gift shops and visitor centers and shuttle buses and marked trails. There are quiet, sacred places where the act of exploration is still a requirement…places that were never supposed to be "easy" to find. With all due respect…I intend to keep them that way. For more info on social media and the great outdoors, check out the Leave No Trace Center’s blog post on the subject. So there you go, four ways to use Instagram for Adventure, and two warnings about what not to do. 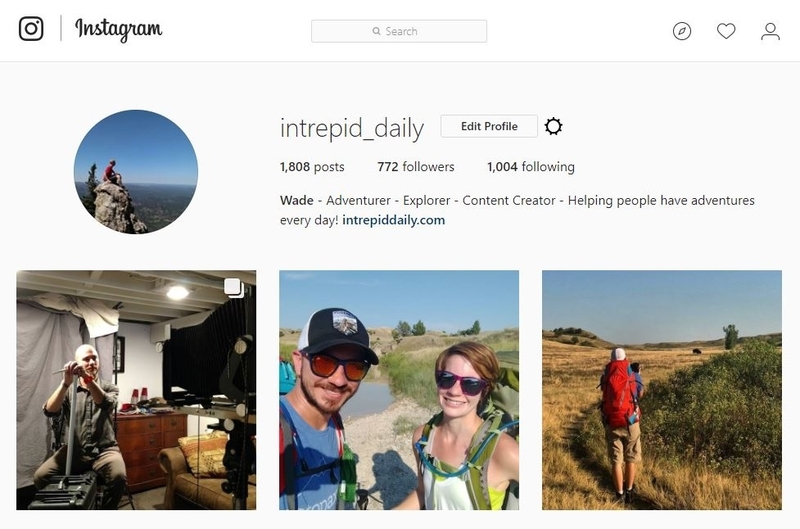 Hopefully this gives you some ideas about how to better use social media, engage with adventure community, and protect the places in which we love adventuring. Feel free to follow my adventures on Instagram, and let me know if you’ve used social media to up your adventure game. Great article there Wade – and you picked out some great IG posts to illustrate it too. All good advice with the most important to my mind being “to be there” and enjoy what you do. I prefer IG my self over FB and Twitter but use them all. But there are experiences that can’t be adequately described in writing, or shared in a photo. Best to dive into those moments! I definitely find myself searching for that perfect IG moment, which can be bad, but it’s also gotten me around corners and up rocks and into places I otherwise wouldn’t have gone. I had even thought about it from that perspective! The idea of sharing has driven your adventuring to new heights, and that’s pretty awesome! I struggle with it myself quite a lot. On the one hand, it has been a fantastic way to meet people and engage with the adventure community. It has made me discover people and places like nothing else ever has. But it is so time consuming. I often just give up on it because of that. I snap photos and think ‘I’ll Instagram them later’. But later arrives and I can’t bring myself to share the photos because I’ve either moved on or just can’t be bothered to do the work. I often feel overwhelmed by checking social media too. The algorithm in place make me feel like I don’t have control over what I want to see and how I want to see it. And that frustrates me so much that I often just give up and don’t check social media too much. I do a lot of content curation; that is, I don’t often post live, instead I go back and post later myself. I am trying to use the story function more, which has led to some interesting conversations. I do understand the feeling of lacking control of what you see. Instagram specifically keeps doing different things with their algorithm. They are also doing some strange stuff with shadowbanning different tags and the like, which is making it a bit more challenging to engage in the community.